8th February 2019 beloved husband of Debbie, loving father of Lee, Debbie, Christina and stepfather of Adele and Diana, a much loved granda, great granda and brother of Debbie and the late David. Funeral from his home, 1 St Columba’s Walk, Greysteel on Monday at 9.25 am for 10 o’clock Requiem Mass in St Finlough’s Church, Ballykelly. Interment afterwards in the adjoining cemetery. Family flowers only please. 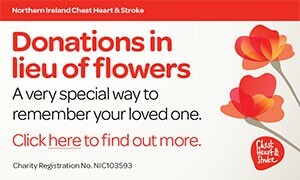 Donations in lieu of flowers if wished to the Foyle Hospice, 61 Culmore Road, Derry, BT48 8JE. I am sorry to tell you that Robert (Bob) CAULFIELD has passed away.